Stir-frying is one of the most commonly used techniques in Chinese cooking. 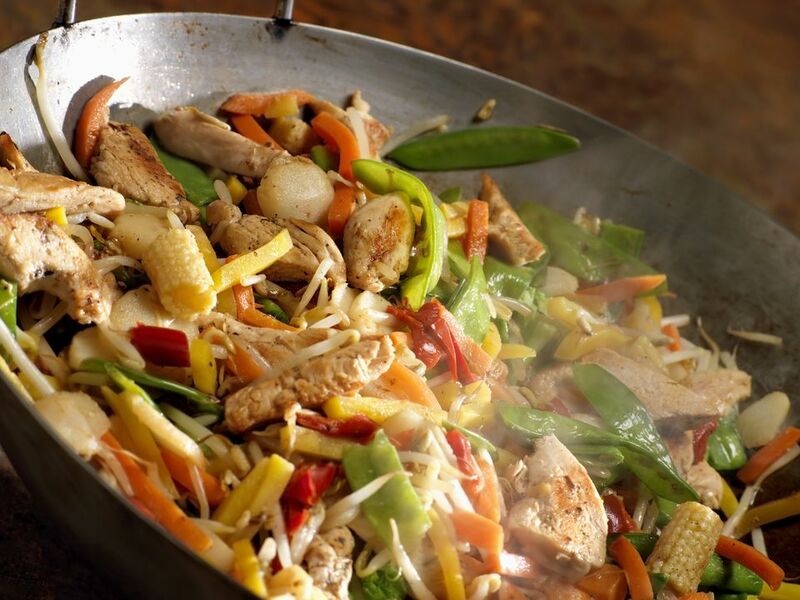 The key to making a really good stir-fry is using a very high cooking temperature and cooking the food really quickly. Because stir-frying involves cooking food at high heat, it’s important to choose an oil that has a high smoke point. If you don't, the oil will burn and the whole dish will be ruined. Oil that is heated to its smoke point or higher will actually begin smoking and will start to impart a bitter taste to the food. The oil is breaking down at a molecular level so it can produce carcinogens, which are bad for you. Chinese cooks normally use soybean oil, vegetable oil, or peanut oil, all of which have a high smoke point. Peanut oil usually has a pleasant nutty flavor and is suitable not only for stir-frying but also for deep-frying. Canola oil, which has a high smoke point but a neutral flavor, is also a good choice. Other types of oil you can use are corn, soybean, and coconut oil. Although you may not consider it, you can also use olive oil to cook a stir-fry. Don’t confuse this with extra virgin olive oil. Extra virgin olive oil has a very low smoke point with a strong flavor making it completely unsuitable for stir-frying. Can Olive Oil Be Used for Stir-Frying? Grapeseed oil is becoming more popular; it is made from the seeds of grapes after the wine has been pressed. It has a clean flavor and a high smoke point (420 F/195 C), as well as similar health benefits to olive oil but with a more neutral flavor. Both canola oil and olive oil are low in unhealthy saturated fats and high in healthy monounsaturated fats. Scientists believe monounsaturated fats help to lower bad cholesterol (LDL) which can clog arteries and lead to heart disease or strokes, while they increase the level of good cholesterol (HDL) that removes cholesterol buildup from the arteries. Grapeseed oil is low in saturated fat and high in polyunsaturated fat, which scientists believe can also help raise HDL levels. Grapeseed oil is also a good source of linoleic acid. That is a type of essential fatty acid which, like the Omega-3 fatty acids found in salmon, can’t be manufactured by our bodies and must be obtained from food. Besides extra-virgin olive oil, there are other oils to avoid due to their low smoking points. Sesame oil has a very low smoke point, and although there are some Chinese dishes that use toasted sesame oil to fry the ingredients, such as three cup chicken, it is not recommended for high-heat cooking. Be very careful when you heat up toasted sesame oil in a wok. Don’t overheat it, otherwise, it will burn and make your dish taste very bitter. Most of the time in Chinese cooking, sesame oil is only used for seasoning or adding to stir-fry dishes at the end of cooking. Avoid flax-seed oil and don't use butter or shortening to stir-fry. Cut up all your ingredients before heating the oil. Once the oil is hot, you'll want to stir fry quickly at high heat. If you are adding meat or poultry, cook it first and then set it aside. You'll know it's cooked thoroughly. Add ingredients based on the amount of time they need to cook. Broccoli, for example, should go into the wok (or pan) before scallions. Keep your stir-fry moving. If you allow it to sit, you'll end up with something closer to a stew. What is Arrowroot and How Is it Used in Cooking?